POLLUTING VIRGINIA'S RIVERS, CLIMATE AND DEMOCRACY FOR PROFIT. PUTTING THE PEOPLE BACK IN CHARGE. Dominion Virginia Power, our state’s largest utility and biggest corporate campaign donor, is putting its bottom line ahead of our right to clean water, a safe climate, and healthy communities. Dominion spends big bucks to sponsor outdoor events like "Riverrock" because it wants Virginians to think the company cares about our environment. Dominion is fighting for permits to keep polluting Virginia’s most beloved rivers -- like the James -- with toxic coal ash waste left behind from decades of burning dirty coal. And last spring, Dominion secretly dumped nearly 30 million gallons of untreated coal ash wastewater into Quantico Creek, a tributary of the Potomac River. Dominion is fighting to build one of the largest fracked-gas pipelines in the country -- the 600-mile Atlantic Coast Pipeline -- through Virginians’ property, farms and forests, trampling landowners’ rights and threatening to further wreck our climate. With rising seas already flooding Virginia’s coastal communities, we need clean energy like solar and wind, not a new dirty pipeline. Dominion is pouring money into our political system, rigging it against the solutions we need. 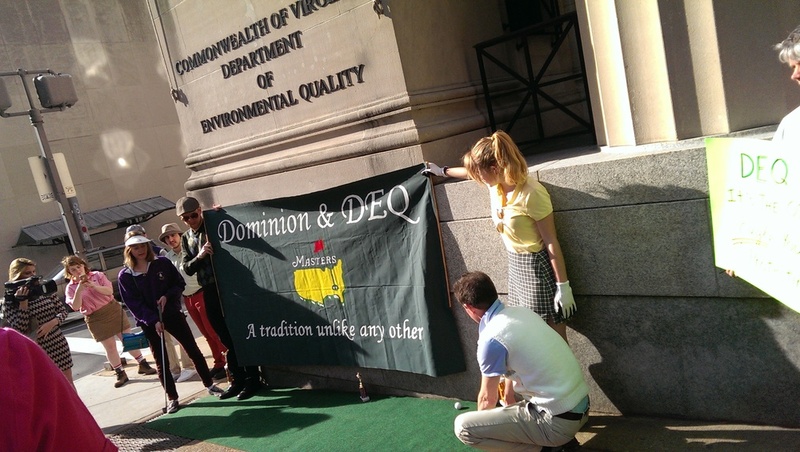 For example, Dominion paid to send our top regulator, Department of Environmental Quality Director Dave Paylor, to the Master’s Golf Tournament and picked up a $1,200 bar tab. 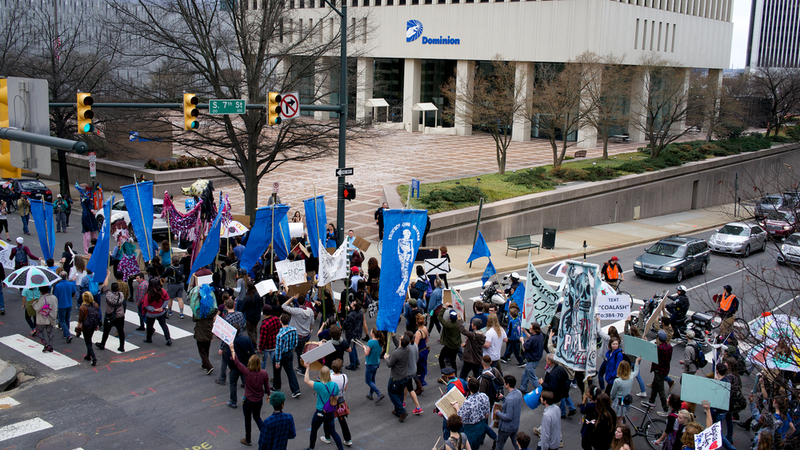 Tell the EPA: It’s time to Hold Dominion Accountable! A young protester at the "March for Our Rivers" in Richmond on Feb. 20, 2016. Last spring, Dominion secretly dumped nearly 30 million gallons of untreated coal ash wastewater into Quantico Creek, a tributary of the Potomac River. At the time, the Virginia Department of Environmental Quality (DEQ) denied any knowledge of the dumping. When news reports exposed the truth eight months later, DEQ claimed the dumping was done legally under existing storm water runoff permits. But experts in Virginia don’t agree. Meanwhile, Dominion applied for -- and received -- lax permits from Virginia’s DEQ and State Water Control Board that allow the company to dump a half billion more gallons of coal ash wastewater into the James River and Quantico Creek. We’ve since learned that DEQ Director David Paylor accepted lavish gifts from Dominion, the very utility he is tasked with regulating. If we can't trust the state regulators whose job it is to protect our clean water, then we need the U.S. Environmental Protection Agency to intervene. By signing, you agree to get updates from the Chesapeake Climate Action Network and Sierra Club Virginia Chapter. I urge the U.S. EPA to launch a criminal investigation into Dominion Virginia Power’s toxic coal ash dumping into Quantico Creek in May 2015. Virginia’s biggest utility isn’t above the law. The company can and must be held accountable. WAMU: Has Dominion's Political Power Clouded the Fight Over Coal Ash?